What does real energy freedom look like? Today, getting on the path to true energy freedom is more feasible than ever, when you work with a solar installer like Renu Energy Solutions who’s ready to help you toward that goal. Step 1 on the road to energy independence: Go solar! When you get solar installed at your home or business, there are basically two ways of reducing dependence on grid power: pursuing energy freedom with or without help from your utility – in other words, going with the grid or moving away from the grid. Many Carolina residents still have good reason to rely on the grid to work with their solar. Those with access to a system called net energy metering get an economic benefit from receiving credit from their utility for extra solar energy the customer doesn’t use. The customer can get a dollar-for-dollar value for any surplus solar power the customer sends to the grid. The ability to virtually store solar energy using your electric utility service – that is, contributing it to the grid and getting credit on your bill to use later – is attractive for some customers. But others don’t have access to such a solar-friendly option from the grid. In 2018, some utility customers in South Carolina looking to go solar will lose the option to make use of net energy metering. A South Carolina law limits how many residential solar customers can participate in the net metering system. hose customers that won’t be allowed to use “net meter” will be given alternative options. Those customers may not be able to receive the whole retail rate back for solar they send to the grid. (Check out organizations like Vote Solar and Solar United Neighbors if you’re not a fan of this and want to do something about it). Want to employ a home battery to guarantee renewable energy all day and night? Residents and businesses can now invest in energy storage to pair with solar, and installing a system that integrates both of those can truly lead to clean energy freedom. For example, imagine the power cuts out. If you have no means of energy production at your home, you’re in the dark until the utility can respond. If you’ve got a backup generator, you’re still at the mercy of fuel availability. However, if you have solar connected to an energy storage system, you can run your essentials pretty much indefinitely, and never experience any disruption at all as your solar replenishes your battery daily. Additionally, you’ll be keeping more of the solar energy you make, so that at night or during times when you need more energy than your solar can provide you’re using your own saved power before touching any power from the grid. It sounds a bit self-centered, but that’s not entirely so. There’s a benefit for the grid whenever a customer reduces their own energy demand during peak usage times. Everyday, at 6:30 PM, folks arrive home, turn on all their lights, appliances and heat or AC, and all their neighbors do the same thing simultaneously! The more homes are using their own solar then, the more it reduces congestion on the grid for a stronger, more resilient energy system (and cleaner air too). This is why Renu Energy Solutions has forged a partnership with SonnenBatterie, to provide a reliable and safe battery with the longevity and custom configuration needed to make backup power work well in our region. It’s also why we’ve established a relationship with Nuance Energy to make better ground mount solar arrays available to energy users. For those with larger electric demand compared to their usable roof space,or where the roof isn’t suitable for solar, there’s now a flexible solution for putting solar in a field or yard. Plus, your solar installation can be movable if you relocate. Looking to find the same sense of energy indepence out of the road? Ditching a gas car for an EV powered with your own solar is also within your reach now. 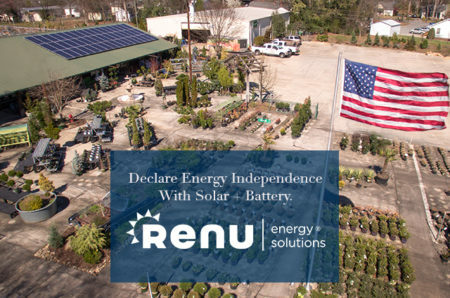 Renu Energy Solutions now packages an expert car charger installation with our solar projects if you’d like to plug in at home, and help reduce reliance on oil and be part of the transition to clean transportation. That’s why we do what we do – helping customers find the way to energy independence, because solar means freedom. Connect with us today to break free from total utility energy with solar.